The Problem: Stormwater and runoff rushes down the street, picking up trash and toxic pollutants. On a rainy day, over 10 billion gallons of contaminated stormwater flows directly — untreated — into rivers, creeks, lakes and our bay and coastal waters. Polluted stormwater and urban runoff include toxins and pathogens that can affect our health, drinking water supplies, and the health of marine life. Contaminants include: Industrial solvents, paints and chemicals; heavy metals like lead, mercury, chromium and arsenic; infection-causing bacteria; pesticides and fertilizers; and trash like plastics, cigarette butts, candy wrappers and syringes. 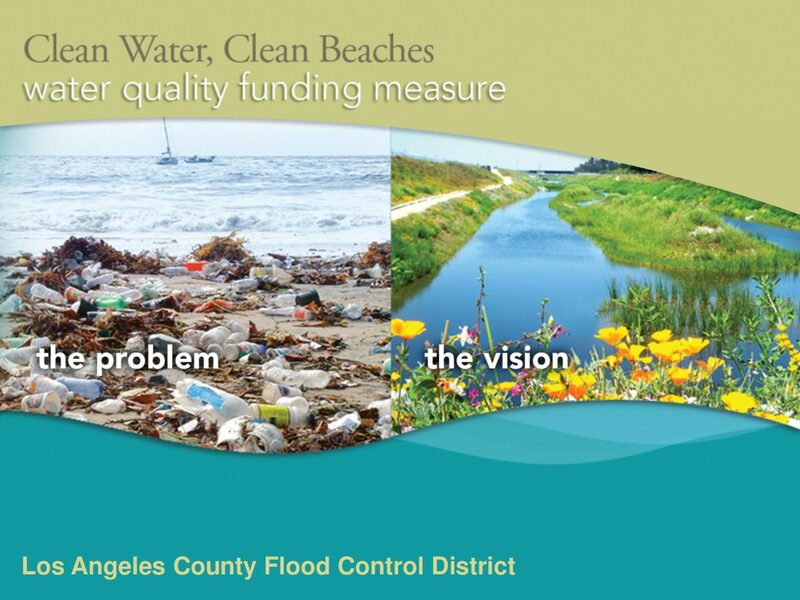 *The proposed solution, a parcel tax to fund stormwater remediation and capture projects, failed before the Los Angeles County Board of Supervisors in 2013. Stormwater impacts from development have been documented extensively in peer-reviewed literature and summarized in the National Research Council’s report titled Urban Stormwater Management in the United States (National Research Council, 2009). To address these impacts, the U.S. Environmental Protection Agency (EPA) Office of Water (OW) evaluated several potential scenarios for managing stormwater from new development and redevelopment using small stormwater retention practices. The objective of these practices is to reduce runoff volume to simulate pre-development hydrology and protect water quality. These practices are often designed to infiltrate the retained water, which can provide groundwater recharge to help maintain predevelopment groundwater levels. For the purposes of this study, infiltration was assumed, whereas in practice capture-and-use or other methods also may be applied. The purpose of the study is to inform valuation of groundwater recharge from stormwater retention in areas projected for new development and redevelopment. Retention practices can prevent the loss of natural recharge that may occur on a developed site without these practices. This study examined a simplified methodology for estimating recharge volume and used observed prices of water for monetary valuation. 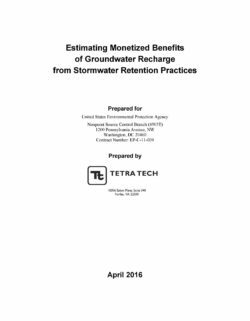 Groundwater recharge is just one benefit within the larger context of the costs and benefits of stormwater retention practices. The full range of potential benefits were not addressed in this study, but the full suite of benefits should be considered when comparing to an estimated cost of implementation. Costs of implementing retention practices in areas of new and redevelopment also were not addressed in this study. The estimates represent the groundwater recharge volume and value that would result if stormwater retention practices were implemented in areas within the contiguous U.S. not currently requiring stormwater retention. The stormwater retention practices were assumed to capture a specified depth of runoff, in the range of 0.5 to 2 inches (i.e. not large storm attenuation) with a goal of reducing runoff volumes to levels similar to those for pre-developed landscape conditions. This approach is commonly referred to as “green infrastructure” for stormwater management or low impact development (LID). 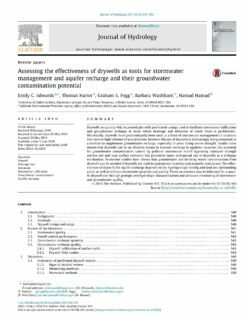 While small storm retention that approximates predevelopment runoff could also be achieved with cisterns in those areas where infiltration is not desired or is not feasible, the option of cistern capture was not evaluated in this study. The timeframe selected for the purpose of the predictive study was the 20-year period of 2021 through 2040. The effects of climate change are necessitating wholesale changes in how water is managed in California. With less water storage from snowpack, California needs to leverage both the current water system and new opportunities to provide sustainable alternatives that can simultaneously accommodate longer and deeper droughts, and more severe, and frequent, episodic and seasonal flooding. This recent cycle of drought and flood, and the passage of the Sustainable Groundwater Management Act (SGMA), provide an enhanced opportunity to modernize State policies related to the nexus between flood management, land use, groundwater management, and ecosystem enhancement. Partnerships, among DWR; other State, federal, tribal, regional, and local entities; and university and private researchers, are actively exploring opportunities to determine how flood and groundwater management can be integrated for multiple benefits. Although integrating flood and groundwater management is not a new concept, the time is ripe to implement an expanded, large-scale integrated program. With the passage and early implementation of SGMA, in combination with climate-induced extreme events, the logic for communities to partner and integrate is evident and imperative. This partnership will help reduce the impacts of future swings between high- and low-flow periods while meeting their communities’ objectives, with the added benefits of improving floodplain ecosystems, preserving working landscapes, and engaging California’s agricultural community in needed solutions, among others. 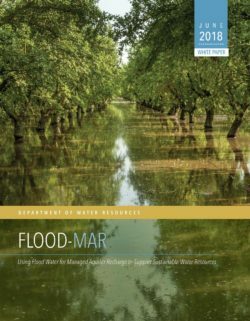 This white paper explores “Flood-MAR”, an integrated and voluntary resource management strategy that uses flood water resulting from, or in anticipation of, rainfall or snowmelt for groundwater recharge on agricultural lands and working landscapes, including but not limited to refuges, floodplains, and flood bypasses. Large-scale implementation of Flood-MAR will fundamentally change how flood and groundwater management are managed. Flood-MAR can be implemented at multiple scales, from individual landowners diverting flood water with existing infrastructure, to using extensive detention/recharge areas and modernizing flood protection infrastructure/operations. Flood-MAR’s potential and value for California is achieved by integrating Flood-MAR with other regional recharge efforts, changing management of California’s water system to better integrate surface water and groundwater, upgrading conveyance, storage, and operations, and considering Flood-MAR’s opportunities as related to water transport and transfers are some of the system integration considerations. This white paper demonstrates the need for Flood-MAR to become an important part of California’s portfolio of water resource management strategies, now and in the future, to help significantly improve water resources sustainability and climate resiliency throughout the state. Using Flood Water for Managed Aquifer Recharge Can Provide Broad Benefits. There is a clear State interest in encouraging, and participating in, Flood-MAR projects because they can provide broad and multiple public and private benefits for Californians and the ecosystems of the state. - Working Landscape Preservation and Stewardship. 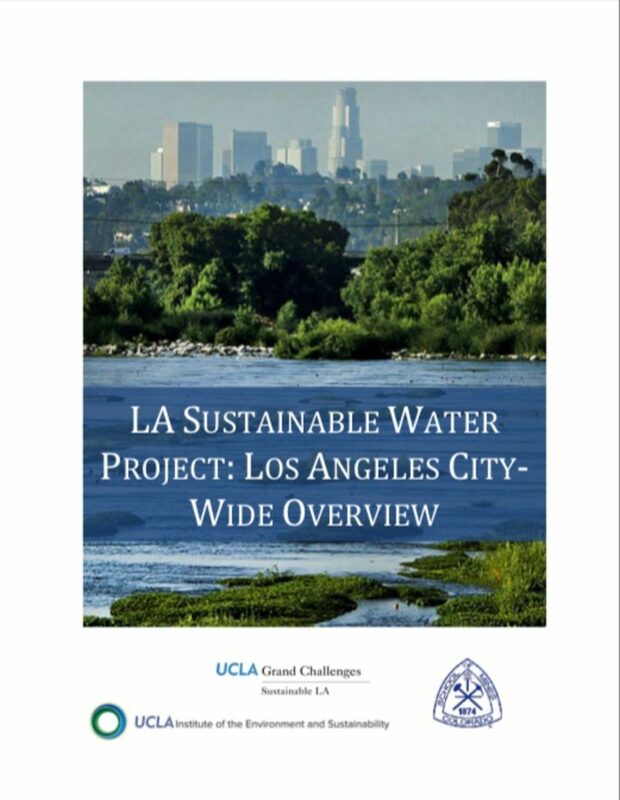 This report assesses the potential to improve water quality standards while integrating complementary One Water Management practices that can increase potential local water supplies for the City of Los Angeles (the City). 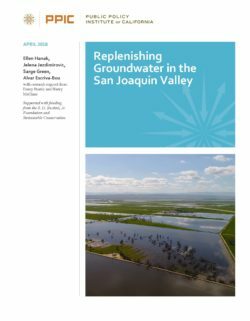 This final report summarizes the current practices and future opportunities at the City-owned Water Reclamation Plants and underlying groundwater basins and highlights the importance of considering all aspects of integrated water management even when dealing with water quality or supply-focused projects. Implementing watershed-scale best management practice programs to meet stormwater permit requirements will significantly improve water quality in all watersheds. However, additional mechanisms such as increasing Low Impact Development implementation and comprehensive source tracking and source control mechanisms will be required to potentially eliminate water quality exceedances. There are multiple efforts occurring in the City and the region to increase the recharge of recycled water into the ground and the volumes of remediated groundwater extracted. This research further assessed the impacts of potential water supply portfolios, with greater volumes of locally-supplied water, on GHG emissions and energy needs of supplying LA’s water. Conservation will be another powerful tool to decrease our dependence on imported water. This research demonstrates the complex interrelationships between all aspects of urban water management, including, for example, stormwater management and local water supply. To ensure a safe and reliable water supply for future generations of Angelenos, one of the City’s key strategies is to increase the local water supply and decrease the need to purchase imported water. However, in large part due to urbanization, the majority of precipitation that falls onto the City flows into storm drains and out to the ocean. In light of these conditions, stormwater is an increasingly viable supply. Capturing and using stormwater on-site can offset potable water demand. Capturing and infiltrating stormwater into subsurface groundwater aquifers increases local groundwater reserves. Both infiltration and capture for direct use enhance the reliability of the City’s water supply. Projects to capture and conserve stormwater runoff comprise an important component of the City’s water supply portfolio. The City is a part of a complex multi-jurisdictional region. As such, implementing effective and comprehensive local stormwater capture projects involves a collaborative effort between several agencies including LADWP, the Los Angeles County Flood Control District (LACFCD), the Los Angeles Bureau of Sanitation (LASAN), the Los Angeles Bureau of Street Services (LABSS), the Los Angeles Bureau of Engineering (LABOE), and the US Army Corps of Engineers (USACE). Additionally, LADWP partners with many community-based organizations to leverage their relationships with the residents of the City. Working together on projects that have multi-benefits for multiple agencies allows for the opportunity to cost-share and reduces the financial burden. Changing demographics, climate change, and competing interests for available water supplies all present long-term risks to the stability and reliability of the region’s imported water. The region recognizes that today’s challenges require an integrated water resources management approach. For decades, this region has operated and maintained one of the most effective flood control systems in the world that protects millions of people from the impacts of flooding in the region. This system sends much of the stormwater runoff into the ocean, water that historically recharged local groundwater basins, making this region even more dependent on imported water supplies. As regulatory pressure to clean up polluted stormwater runoff continues and imported water resources diminish, this local source of water supply is becoming more and more attractive (GLAC IRWMP 2014). Many of the region’s water management agencies have studied and planned for increasing use of local recycled and graywater supplies, ocean and brackish desalination, developing more groundwater, and implementing improved water conservation initiatives to extend existing supplies. Additionally, social trends and concerns also drive the emphasis on the use of local water supplies. However, the one major local resource that has not been studied in-depth is stormwater and its opportunities to optimize the reliability of local supplies. 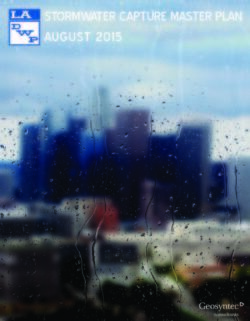 To enhance the capabilities of the existing stormwater conservation infrastructure within the Los Angeles Basin, the LACFCD began to investigate long-term projected needs and future climate conditions within the region. Given that local groundwater plays such a vital role in the region’s water supply portfolio, detailed scientific, engineering, and economic analyses were conducted to identify strategies for enhancing stormwater capture for groundwater recharge. • Use state-of-the-art climate change analysis to develop projections of future water supply and demands in the Basin. • Analyze how the Basin’s existing water infrastructure and its operations will perform in the face of changing water realities. • Develop and highlight opportunities to adapt to current and future water demands. • Conduct a trade-off analysis of identified opportunities. Concepts ranged from enhancing the existing stormwater capture system and modifying existing facilities (including those capturing runoff for groundwater recharge), to developing new structural and nonstructural concepts that could help resolve future water supply and flood risk issues. 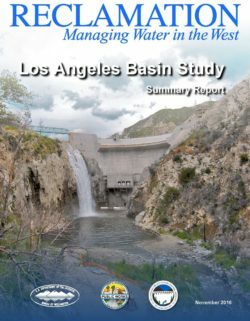 This Summary Report presents highlights of the critical tasks associated with this Basin Study and the results and findings produced throughout this collaborative study effort. Implementing integrated water management systems (IWM) that incorporate all components of the urban water cycle, including imported water, local groundwater, captured stormwater, greywater, and treated wastewater is crucial to creating a sustainable water supply for the city of Los Angeles (City). The City has researched, written, and initiated implementation of recommendations from many reports critical to creating an IWM plan for the City as well as to defining the current capacity of the system. While work on this issue has been ongoing for many years, the extreme drought currently impacting water supplies throughout California has created a new urgency to increase the City’s ability to provide a secure water supply through local sources. In April 2015, Governor Brown directed the first-ever statewide mandatory cut of 25% in urban water use due to the continuing drought conditions. In addition to statewide efforts, many policies and plans have been created on a local level within the City that address urban water management, integrated resources planning, stormwater capture, and groundwater management. The Los Angeles Mayor’s Office recently set strong goals to increase the sustainability of the City’s water supply over the next several years. The goals included completing a comprehensive sustainability plan containing objectives for water supply and demand in the City, which was released in April 2015 (Sustainable City pLAn). In an emergency drought directive released in October 2014, the Mayor identified additional accelerated water goals including reducing per capita potable water use by 20% by 2017 (from 2014 base-line of 130 gallons per capita per day (GPCD) to 104 GPCD), reducing the City’s reliance on MWD water by 50% by 2025, and converting 85% of public golf course acreage to recycled water by 2017. Through building upon regional research and reports that have been generated on potential components of the local water supply portfolio (e.g., groundwater, recycled water, and stormwater), as well as gathering and analyzing current data on flows of water and wastewater throughout the City systems and environment, this project further identifies and refines opportunities to implement integrated water management throughout the City. As water quality regulation in the Los Angeles area currently drives much of the current water management practices, we examined greater water self-reliance through this lens. Therefore, the City has been divided by watershed to assess Total Maximum Daily Load (TMDL) compliance alongside integrated water management opportunities and challenges that exist and must be addressed in order to meet water quality compliance requirements and maximize local water supply. 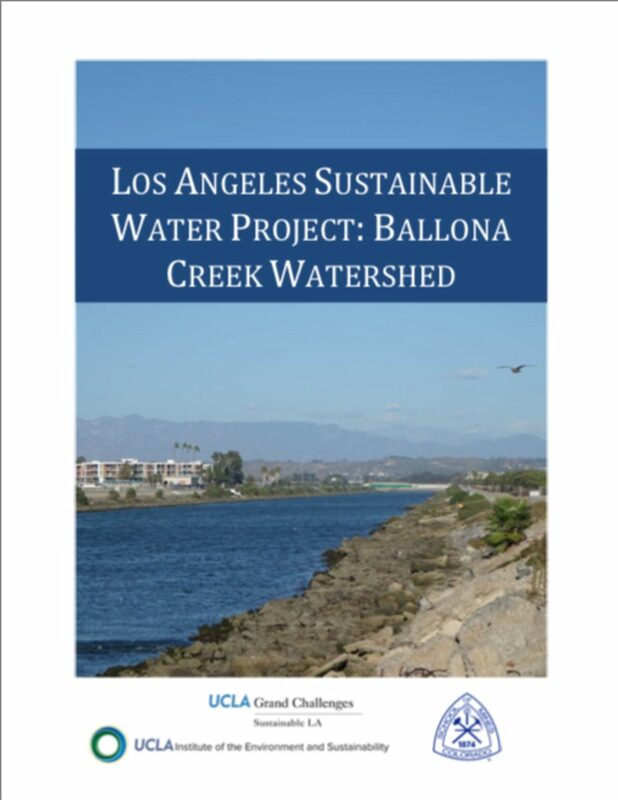 This first report focuses on the Ballona Creek Watershed and the Hyperion Service Area; following reports will focus on the Dominguez Channel and Los Angeles River watersheds. Clarify rules on water available for recharge. The State Water Board needs to develop an expeditious process for enabling water users to capture surface water when it is available. Beyond the legal aspects of establishing rights for diversion and storage, an essential part of this process is technical: developing a simple, rapid way to determine when river flows exceed water required for environmental purposes and downstream users. Evaluate infrastructure capacity. One of the key challenges for expanding recharge is that most available flows are in the northern part of the valley, while most of the overdraft?and best recharge lands?are in the south. In addition, these flows are mainly available for just a few months. A top priority is to evaluate opportunities for improving the use of existing infrastructure (conveyance facilities, surface reservoirs, and recharge basins) and determine where additional investments are warranted. A big bottleneck is likely to be regional conveyance, which is inadequate for capturing and moving high flows to suitable recharge locations. Improve recharge on farmland. Active recharge on farmland may be one of the most promising ways to capture water cost-effectively in wetter years, but it is low relative to its potential. Significantly ramping up this practice will require addressing a suite of technical issues and establishing incentives. Address regulatory barriers. State and federal agencies need to improve processes for approving construction of new recharge projects, moving recharge water through their conveyance facilities, and enabling more flexibility in where water is stored. Water managers and growers also need guidelines from the state for implementing on-farm recharge in ways that are consistent with water quality rules. Strengthen groundwater accounting. Better accounting of water going into and out of groundwater basins is key to sustainable management. It is also needed for developing incentives for growers to recharge, encouraging recharge partnerships, and informing decisions on new investments. Making the most of recharge opportunities will require high levels of cooperation among a wide variety of stakeholders. Local and regional partnerships?for capturing and moving water efficiently, making new investments, and devising projects that bring multiple benefits?are key to helping the region manage this critical resource over the long-term.